Probably the fastest growing brand in Thailand is The Coffee Club, after opening its sixth outlet, this time on Naklua Road (opposite Soi 18). 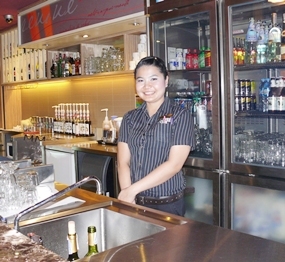 From some rather simple beginnings in 1989 in the West End of Brisbane, The Coffee Club now has more than 270 outlets in Australia, New Zealand, New Caledonia and China as well as Thailand, with the first one in Phuket in 2009, followed shortly after by Pattaya in the Royal Garden Plaza. The ambience is all black, brown and chrome, and the staff are very welcoming in their Coffee Club black outfits. The kitchen is on view and was spotless, as was the restaurant itself, which has three sections – an al fresco overlooking Naklua Road, an air-conditioned inner area and then another section upstairs. In all, there is seating for 142 diners. This latest branch of The Coffee Club in Naklua is very easy to find. After coming from the Dolphin roundabout head towards Naklua and The Coffee Club is on your right hand side, almost exactly opposite the mouth of Soi 18 on your left. We went on a Wednesday night and there was plenty of kerb-side parking. The menu is the same for this branch as for the Royal Garden Plaza outlet. Neither overly expensive or extensive, but comprehensive enough to have something for everyone. The six pages begin with different coffees (as you would expect in a place called The Coffee Club), with nine on offer plus liqueur coffees. Of course there are also juices and soft drinks. There is a separate menu for wines, spirits (B. 190) and beers (B. 90), with all wines under B. 1,000. We drank the house white, an Australian Treeline Chardonnay, good drinking at B. 190 for a good-sized glass. The second page has breakfasts (the restaurant opens at 6.30 a.m.) ranging from simple toast and jam (B. 50), through three large omelets (three eggs) at B. 155, and on through many choices until the Big Breakfast with everything at B. 280. Next up are starters, sides and salads, with Caesar, Garden, Greek and Asian chicken (B. 140-160), plus a range of extras you can add in to personalize your own salads, such as smoked salmon, grilled chicken, prawns and a lemon-pepper calamari. Next on offer are the gourmet sandwiches and open grilled sandwiches. These are presented on a thick Turkish bread (made from a wheat flour) and range between B. 160-210. Light meals include fish and chips (B. 195), BLT and chips (B. 195) and then there is a Kid’s Club menu (B. 100-195) and has the perennial children’s favorites such as chicken nuggets, fish and chips and a grilled sausage sandwich and chips on the Turkish bread, which comes as a very large portion. There is a page of Thai food, generally B. 120 and 11 different items to choose from. The final page has grills (B. 245-415) and pasta (B. 165-210). The meats are served with your choice of sauces including Hollandaise, mushroom or peppercorn and with vegetables or salad all included. We went with two children aged seven and six. The dedicated Kid’s Club menu certainly made selection easier, and being pictorial, they (and we) knew what was coming. The food was well presented and came hot to the table. The junior tasters definitely gave the Coffee Club the thumbs up, with nothing being left on the plates, despite the servings being large. The adults were equally impressed with good-sized portions of correctly cooked food. The chicken, bacon and cheese supreme is made with a chicken breast folded around bacon and mozzarella cheese and served on a creamed potato mash and spinach, a dish which would not be out of place in any hotel restaurant. As the GM for Thailand, Michael Chick, said, “We present ourselves as being an alternative to hotels, with the same quality, but cheaper.” At B. 245 for this dish, he is totally correct. All of us enjoyed the evening, and the children were still talking about the next day. Definitely recommended. 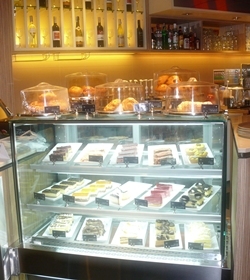 The Coffee Club (Naklua), Pattaya Naklua Road opposite Soi 18, open 6.30 a.m. until 11 p.m. seven days. Plenty of on-street parking. Telephone 038 371 162.